This summer, the Catlin Arctic Survey team became the first explorers to ever take ocean water samples at the North Pole. 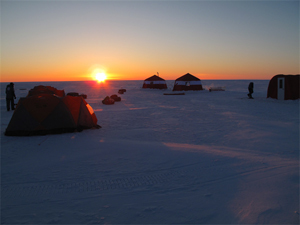 The three-person team covered 500 miles over 2 1/2 months in their expedition across sea ice off the coast of Greenland. On the way they were met with numerous obstacles: a persistent southerly drift that regularly pushed them backward, strong headwinds, ice cracks opening under their tent, dangerously thin ice, and areas of open water they had to swim across. They persisted through it all, measuring ice thickness, drilling ice cores, and collecting water samples (see the video below) and plankton data. They hope their research will provide insight into the effects of carbon dioxide on local marine life and Arctic Ocean acidification. The heartiness of the Catlin team reminds us of the rich history of polar exploration in the name of meteorology. Historian Roger Turner of the University of Pennsylvania gave a fascinating presentation at the AMS Annual Meeting in Atlanta about the origins of the tradition, spotlighting the group of young Scandinavian meteorologists who studied under Vilhelm Bjerknes in Bergen, Norway. They were vital contributors to numerous Arctic expeditions in the 1920s. This first wave of Bergen School meteorologists was well-suited to polar exploration, where they contributed their familiarity with the Far North conditions as well as their new understanding of upper-air dynamics. But Turner argues that their affinity for outdoors activities–particularly in the harsh conditions of the Arctic–also set them apart from others in their generation and, by implication, from the desk-bound meteorologists today. We think those hardy meteorological pioneers of yesteryear would appreciate the intrepid scientific spirit of the Catlin team.